For Sally Kirkland the Vogue & Life editor, see Sally Kirkland (editor). Sally Kirkland (born October 31, 1941) is an American film and television actress. She was nominated for an Academy Award for Best Actress for Anna (1987). Kirkland was born in New York City, New York. She was named after her mother, Sally Kirkland (born Sarah Phinney), who was a fashion editor at Vogue and LIFE magazines, and was raised in Oklahoma. Her father, Frederic McMichael Kirkland, worked in the scrap metal business. Kirkland began acting Off-Broadway in 1963. After a few uncredited and bit parts in film and television, she appeared in the underground film Coming Apart (1969). In the 1970s, she had small roles in popular films such as The Sting, The Way We Were, A Star Is Born and Private Benjamin. She was nominated for an Academy Award for Best Actress for Anna (1987), and she won a Golden Globe Award and an Independent Spirit Award for Best Performance by an Actress in a Motion Picture. Kirkland hosts a weekly program on the syndicated HealthyLife Radio Network. Kirkland has had frequent television roles, including The Simple Life 5: Goes to Camp, Three's Company, The Incredible Hulk, Murder, She Wrote, High Tide, and the soap operas Valley of the Dolls and Days of Our Lives. Films in which she has appeared include EDtv, JFK, Adam and Steve and Coffee Date. Kirkland is also a health activist including advocating for women harmed by breast implants. She founded the Kirkland Institute for Implant Survival Syndrome in August 1998. Kirkland is an ordained minister in the Movement of Spiritual Inner Awareness. ↑ "Sally Kirkland". The New York Times. ↑ Catsoulis, Jeannette (September 11, 2014). "A Weakness for Cops, a Crime to Solve 'Archaeology of a Woman,' Starring Sally Kirkland". The New York Times. 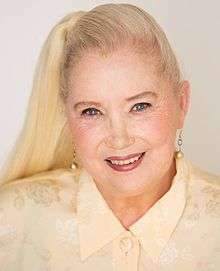 ↑ Straight to the Heart of Hollywood Moxie: A Candid Interview with Sally Kirkland Moxie Magazine. 2000. ↑ "The Love Nest". lortel.org. Lucille Lortel Foundation. Retrieved 22 October 2016. 1 2 Gruber, Xaque (February 22, 2012). "25 Years After Anna, Sally Kirkland Reflects on the Oscar Race for Best Actress". The Huffington Post. ↑ "Best Performance by an Actress in a Motion Picture - Drama". goldenglobes.com. Retrieved 22 October 2016. ↑ Maslin, Janet (October 2, 1987). "Anna (1987)". The New York Times. ↑ "Sally Kirkland Show". healthylife.net. Retrieved 22 October 2016. ↑ "K.I.I.S.S KIRKLAND INSTITUTE OF IMPLANT SURVIVAL SYNDROME". Sallykirkland.com. ↑ Stanley, John (May 5, 1991). "Who Ya Gonna Call? / Sally Kirkland vs. ghosts in "fact'-based "The Haunted'". San Francisco Chronicle. p. 48.